Napoleon had used speed and decisiveness to achieve the coveted central position between Wellington and Blücher. Napoleon’s chief goal was to keep the two allied armies apart and defeat them in detail. 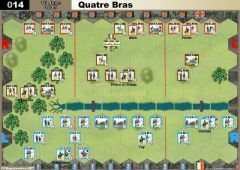 Ney moved against the concentrating Anglo-Allied forces at Quatre Bras, while Napoleon hoped to attack the Prussian army at Ligny, with the III and IV Corps. Blücher obliged by refusing to retreat even though his IV Corps was still not present. Napoleon’s attack started around 2:30, when he heard cannon fire from Quatre Bras. French artillery felled thousands of Prussians on the exposed forward slopes Soon Saint-Amand was in French hands. A counterattack was ordered, but not until Blücher intervened personally, was Saint-Amand retaken. Meanwhile at Ligny, the French IV Corps succeeded in capturing the church, but could not advance further because of lethal Prussian artillery fire. 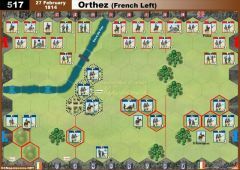 Subsequent French attacks to take Ligny were stopped at great cost. 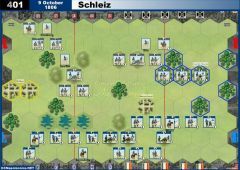 About 7:00pm, Blücher collected his last reserves to mount one more effort against the French left, stabilizing the Prussian line, but Blücher was wounded and had to leave the field. Napoleon’s battlefield skills were waning. He should have brought up his I and VI Corps to win decisively but neither fired a shot. As darkness fell, Napoleon knew he could not destroy the Prussian army, but committed his Guard to cripple it and keep it out of the fight for several days. 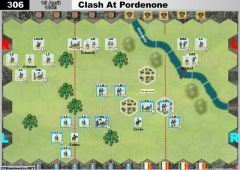 The Guard tore through the fatigued, disorganized Prussians, compelling a disorganized Prussian retreat. 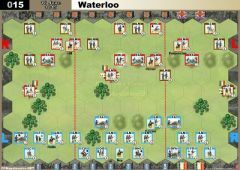 To his credit, Blücher was able to restore order and retreat toward the Anglo-Allied Army, making victory possible at Waterloo two days later. 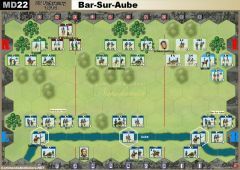 • The Ligny brook stops movement, but an infantry unit after a successful melee may take ground and a cavalry unit may breakthrough. 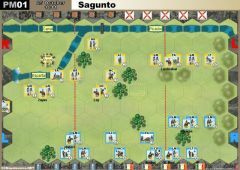 In addition, cavalry unit ordered by a charge card, that attacks into, out of, or when it moves across or moves across on its breakthrough, will not gain the addition dice listed on the charge card. Played this again against a different opponent and side and a similar grind resulted. 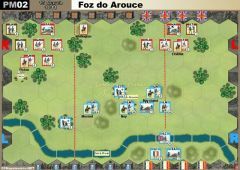 French prevailed 12-6 in what was a blood bath. They had only 3 full strength infantry units left at the end with a number of 1 block units skulking in the rear. Prussians lost 11 units and a leader but otherwise were intact but with a lot of their offensive power blunted. Including set up and pack up game went for 2.5 hours. Definitely a grind this one! Picked this as the first scenario to play from Exp 4. What a tough fight! Played as the Prussians against MasterChief's French and this has been the longest scenario of C&C I have ever played - 3 hrs! 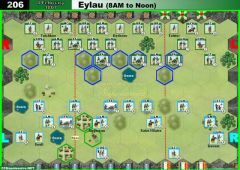 Got halfway thru the deck when the French played Élan and forced a reshuffle. Then we used up another half of the deck before a result was reached, 11-7 to the Prussian inc 2 banners for the majority control of town hexes. French just couldn't get a roll on and in the end attrition won the day. 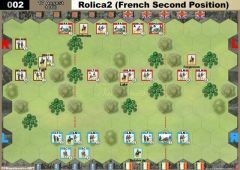 Both sides had a number of reduced units (1 or 2 blocks) at the end sitting near their respective baselines and the Prussians only played 1 Iron will counter - to ensure they got to attack back after a French play of First Strike rolled 1 flag that could not be ignored. A rash Prussian counter in the mid game cost them 2 banners for the gain of only 1 but forced the remaining single block French Light to beat a hasty retreat to the base line. 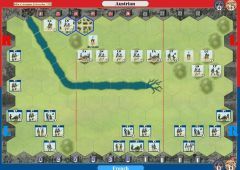 Timely play of Cavalry charge by the Prussian at the end along with a strange French move before hand which gave the majority victory banners to the Prussian won what was a slow grinding battle which reflected history quite well except for the end result. The Ligny brook has no battle restrictions, but stops movement and will break charges. 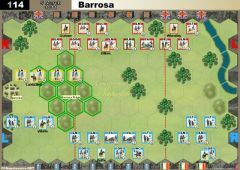 Meaning, a cavalry unit on or that crosses the stream when ordered by a Charge card, will not gain the additional dice listed on the card. hexes; The bridges use their normal rules!